Pamper skin with the Erbaviva Stretch Mark Cream; a plant-based treatment infused with signature organic essential oils to help repair and heal damaged skin while tackling discolouration, scars and stretch marks. Enriched with Cocoa Butter and Sea Buckthorn extract, the rich and creamy formula effectively replenishes moisture and improves elasticity levels to aid skin stretching. A delicate balance of Rosemary, Carrot Seed and Sandalwood Oils keeps skin feeling smooth and supple. 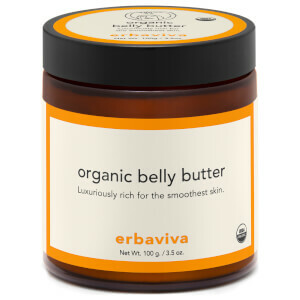 Ideal for use both during and after pregnancy, the nourishing cream seeks to alleviate the appearance of stretch marks and prevent further from developing using organic, sustainably sourced ingredients for minimal irritation. Use during the 1st trimester, before the skin begins to stretch. Apply liberal amounts to breast, belly, hips, and back side, at least twice per day. Massage in a circular motion to encourage maximum absorption. Water, *Aloe Barbadensis Leaf Juice, Hydrogenated Palm Kernel Glycerides, Hydrogenated Palm Glycerides, *Helianthus Annuus (Sunflower) Seed Oil, Polyglyceryl-6 Distearate, Glyceryl Stearate, *Simmondsia Chinensis (Jojoba) Seed Oil, Glycerin, Cetyl Alcohol, Stearyl Alcohol, Xanthan Gum, Tocopherol, Laminaria Digitata Extract, Algin, *Rosemarinus Officinalis Leaf Extract, *Theobroma Cacao (Cocoa) Seed Butter, *Hippophae Rhamnoides (Seabuckthorn) Fruit Extract, *Hippophae Rhamnoides (Seabuckthorn) Kernel Extract, Citric Acid, Sodium Benzoate, Potassium Sorbate, *Lavandula Angustifolia (Lavender) Flower Oil, *Citrus Nobilis (Mandarin Orange) Peel Oil, Daucus Carota Sativa (Carrot) Seed Oil, Rosa Damascena (Rose) Flower Oil, *Santalum Spicatum (Sandalwood) Oil. *Denotes Certified Organic Ingredient.